When you have a tooth that has been damaged on the surface or has suffered decay, a porcelain crown can be used. It also works well to restore and protect a tooth that is broken, has an old filling, or on a tooth that has an increased potential for fracture. 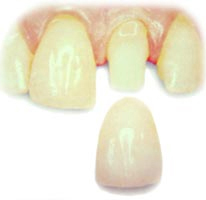 This type of crown is an excellent solution for a front tooth that is visible. It is made of a tooth-colored porcelain and simply slips over your natural tooth. In the past, a metal foundation was required whenever porcelain was used on a crown so that it would be strong enough for regular use. With the recent advances in bonding technology, a dental crown can be made out of all porcelain. When porcelain is used on your front teeth it can be beautiful and virtually indistinguishable from your other teeth. When these crowns are placed by an excellent cosmetic dentist like Dr. Collins, they will look so natural that no one will know that you have had any cosmetic dental work done. The color, shape, gloss, and translucency of the porcelain can be manipulated to give you beautiful, life-like results. Porcelain-fused-to-metal crowns on front teeth often result in an opaque color that is noticeable and looks unnatural. And although the metal foundation makes the crown strong, you may notice a dark line near the gumline. However, they are generally stronger than all porcelain crowns which means that they can work well on back teeth that are not visible. Below you can see these two different types of crowns. With the porcelain-fused-to-metal crowns on the left, you can really see the opaque appearance and the black line that is present due to the metal framework. On the right, you can see how beautiful all-porcelain dental crowns can be. If you would like to find out what type of crown is best for you, we invite you to come in for a complimentary consultation. We can evaluate your specific case and make recommendations.